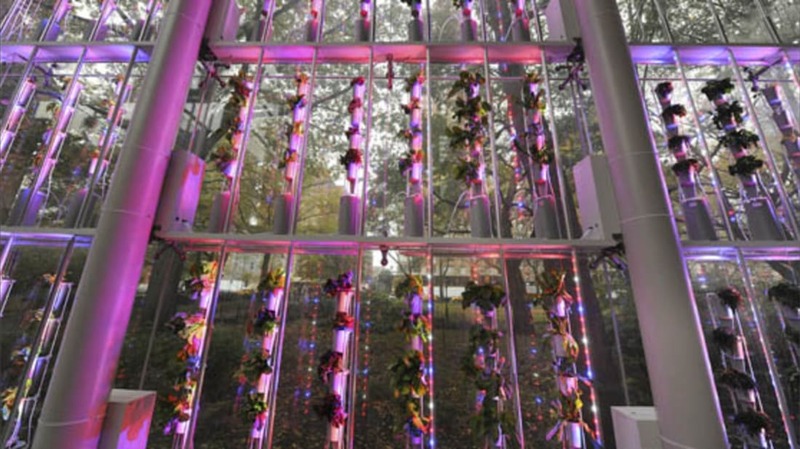 A hydrophonic vertical growing system, designed by Windowfarms, in the museum's Weston Pavilion. Photo Courtesy AMNH. On November 17, the American Museum of Natural History will open a new exhibit, Our Global Kitchen, which examines how food is grown, modified, transported, tasted, and celebrated. "Food is intimately familiar to all of us—and experienced as a daily social ritual—but the complex global system that produces it has critical implications for the health of humans and of Earth's ecological systems," Ellen V. Futter, president of the museum, said at a preview of the exhibit. Visitors will get a chance to see what an Aztec market looked like, participate in tastings, sit at the tables of historical figures, examine various farming practices from around the globe, and learn how hunger and obesity exist side by side. Here are 11 things we learned during our visit. 1. Five species of beans have been bred into approximately 40,000 varieties. 2. Cabbage, broccoli, Brussels sprouts, cauliflower, kale, and kohlrabi are all actually the same species: Brassica oleracea. 3. In ancient Aztec markets, cocoa beans were currency, not candy. Thirty cacao beans would buy you a rabbit. 4. The bumps on your tongue, called papillae, aren't actually tastebuds—your tastebuds are actually inside those bumps. The more papillae you have, the better you're able to taste—in fact, if you have 30 or more papillae per quarter-inch, you're a super-taster! 5. In parts of Asia and the Middle East, sheep are bred to have fat tails that are so big that they have to be dragged in special carts. 6. Almost every apple you eat is cloned in a process called grafting—live branches from trees that produce sweet apples are attached to the trunks of other trees, which produce apples that are clones of the first tree. 7. Wild chickens like the Red Junglefowl produce approximately 15 eggs a year; domesticated chickens produce 200 to 300 eggs. 9. Young oysters are called spat; 90 percent of Europe's oysters are raised in France at aquatic farms like the one shown in the diorama below. 10. One variety of potato was the primary food in Ireland before the potato famine. It was called the Lumper. 11. In high and middle income countries, each consumer wastes approximately 187 pounds of food each year. In low income countries, that number is 33 pounds.